Research has proven that your family history can determine if you will develop anxiety issues. For instance, if your parents or other close relatives have evidence of anxiety disorders, then you are at a higher risk of developing it in during your adulthood years. Likewise, studies performed on identical twins have showed that if one of the twins develops any form of anxiety disorder, then the other twin will most probably develop similar symptoms. Furthermore, if you are brought up in a family setting whereby fear and anxiety are constantly displayed on a day to day basis, then you are also likely to get affected during your adulthood. Most of our brain activities involve learned behaviour which we mostly inherit from our family members as we grow up. Therefore, by altering your thought patterns using Cognitive Behaviour Therapy, then you can successfully overcome anxiety. Anxiety has been linked to abnormal rates of neurotransmitters in your brain. Neurotransmitters or chemical messengers are responsible for regulating thought and feelings in the brain. The two key neurotransmitters found in the brain are dopamine and serotonin. So whenever they are pushed off balance, the transmission of messages to your brain cells will be blocked. Consequently, you will be unable to control your feelings and thoughts and end up feeling anxious or depressed. Scientific research also shows that some forms of anxiety related symptoms such as stress, depression, exaggerated fears and panic arise due to chemical imbalances between the right and left sides of the brain. In most cases, individuals who exhibit these symptoms are treated using general medications that help to restore the normal chemical composition of the brain. Since these forms of treatment have always proven to be effective, it justifies the fact that your brain chemistry may contribute to the rise of anxiety disorders. Environmental factors are the largest causes of anxiety disorders amongst the affected. Each and every day, we go through potentially traumatic and stressful events that can easily lead to the offset of anxiety. These may include financial problems, work related demands, emotional or physical abuse, disease, schoolwork, divorce, pregnancy or even the death of a loved one. Unfortunately, some of these life events are beyond our control and may occur spontaneously without warning. This attribute makes them top anxiety instigators. Psychoanalysts also believe that a person’s personality can contribute a major role in determining how well an individual copes to such stressful and traumatic life events that may come their way. They state individuals suffering from lower self-esteem or poor coping skills are more vulnerable to anxiety disorders than those with higher self esteem and highly tolerant to outward events. This is because people with lower self esteem easily inflict stress upon themselves when faced with challenges. If stress is left unchecked for prolonged periods, it generates anxiety. In some other cases, people who are addicted to drugs such as cocaine, caffeine and amphetamines are also prone to anxiety. It is well known that cocaine addiction causes anxiety symptoms such as fear and panic and this may carry on for many years even after an individual stops using the drug. Other stimulants or prescription drugs are also known to have anxiety as one of their side effects. Other habits such as harbouring negative feelings such as sorrow, anger, resentment, vengeance or constant need for approval may also be potential triggers. When such feelings accumulate in the subconscious mind, one of the ways through which the brain will release them will be through depression and anxiety attacks. In conclusion, it is clear from the above numerous examples that we cannot really point out what causes anxiety. 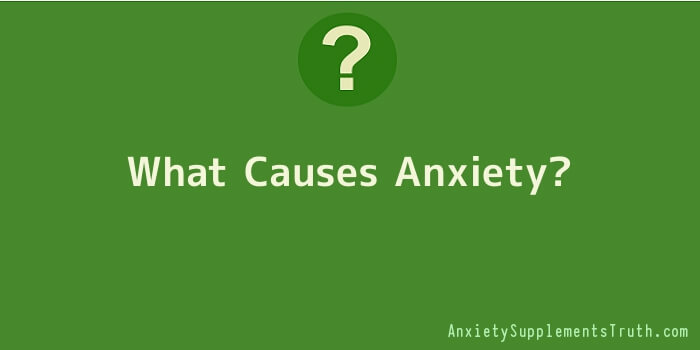 The cause of your anxiety may be due to a combination of two or more of the above factors. Today, psychoanalysts and other practitioners still debate on the various causes of anxiety disorders with new theories coming up each and every other day. Most importantly, if you believe you are suffering from severe anxiety disorder then it is always advised that you seek specialized help. More and more people are being diagnosed with forms of anxiety disorders. Often time’s anxiety can be linked to the human body’s natural “flight or fight” response. Elevated heart rates, fear, panic, difficulty breathing, and cloudy thoughts are caused by an increase in the release of hormones in the body. Think back to the last time you were startled – abruptly. Your body probably reacted with fear and the symptoms above. Your “flight or fight” instinct told you to leave the situation or stay and fight. This is natural. When people experience panic on a regular or semi-regular basis, there can be many sources of elevated hormone levels that cause these frightening physical symptoms. Researchers have found that people that have abnormal heart rates, heart murmurs and other cardiovascular health problems can experience anxiety. The symptoms of heart problems and anxiety are very similar; clammy hands, tightness in the neck, jaw and chest, difficulty catching a breath, rapid heart rate, and many other symptoms. Studies show that as many as 1/3rd of people that have experienced a heart attack or had heart surgery experience anxiety. Your morning cup of coffee is a stimulant. As a stimulant, it can cause you to feel nervous, jittery and moody. Excessive consumption of caffeine can also keep you from getting the sleep you need. Lack of sleep and the effects of caffeine can lead to anxiety attacks with symptoms such as confusion, tingling in the extremities, tightness in the chest, and difficulty breathing. Some medications have adverse side effects that include symptoms that are experienced during an anxiety or panic attack. These medications include thyroid medications, asthma medications, some diet drugs and even some herbal diet supplements. If you are taking any prescription or over-the-counter medications and you are experiencing anxiety, carefully review the product warnings. For prescription medications, talk to you physician prior to abruptly halting your dosage. Our entire endocrine system is responsible for producing the hormones that regulate testosterone, estrogens, insult and more. In a well-functioning endocrine system they work in harmony to give the body the hormones it needs. However, if one becomes out of balance, a whole host of hormone imbalances can occur leading to anxiety and panic attack symptoms. An improperly functioning thyroid gland can over produce causing excess hormone release that can cause nervousness, heart palpitations, irritability, weakness, fatigue and confusion. In addition to the causes above, there are additional medical conditions and mental conditions not to mention external stress that can produce the symptoms of anxiety. Mental conditions including phobias can cause fear, rapid heart rate and lead to an anxiety attack. Chronic stress caused by trauma, financial difficulties, relationship dynamics, and work and school can all lead to anxiety attacks. Millions upon millions of people each year suffer from an anxiety attack. Anxiety and panic attack disorders are more common that people believe. Once you have suffered from one, you understand the helplessness and overwhelming fear partnered with the physical symptoms.